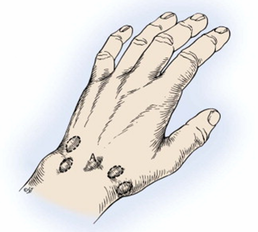 Ganglions are the most common soft tissue lumps found in the hand or wrist. A ganglion is a fluid filled sac which has a stalk leading down to an underlying joint or tendon sheath. The ganglion fluid actually comes from the fluid lubricating joints and tendons, however it tends to be a bit thicker and jelly-like. There are probably a number of different ways in which ganglions can form. Arthritis in an underlying joint is definitely one cause, particularly if a roughened bone spike (osteophyte) rubs away on the surrounding joint capsule and ligaments. Other causes include through weakeness in the joint capsule or tendon lining. No, ganglions are not dangerous lumps. - is directly pressed, for instance by objects held in the hand or flat surfaces. How can ganglions be treated? 1. Do nothing: Ganglions don't have to be treated, and they may go all by themselves. 2. Burst them: traditionally done by hitting them with a bible. Not recommended these days. 3. Aspiration: Using a needle the fluid can be sucked out, but they often recur. 4. Surgery: Excising the ganglion completely. It many still recur, although less often than after aspiration. However there are more risks with surgery.